After an incredibly successful launch on iOS in late August, Disney Interactive has announced the release of Star Wars: Commander on Android and Windows Phone devices. In Star Wars: Commander, players side with either the Empire or the Rebels in the Galactic Civil War, completing missions for Star Wars heroes and villains like Princess Leia and Darth Vader. The game has been downloaded more than five million times on iOS alone, and players have, for now, sided with the Dark Side more often than not. This release on Android and Windows Phone introduces cross-platform gameplay to the title, as users can download the game on multiple devices and have their progress waiting for them. In addition, guilds, leaderboards, multiplayer battles and other social features support users from any gameplay device, widening the potential pool for creating friends and allies in the game. 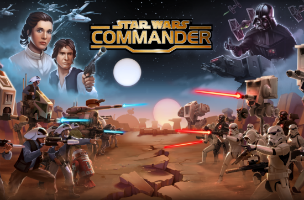 Star Wars: Commander is available to download for free on the iTunes App Store, and is now available for free on Google Play, the Windows Phone Store and the Windows Store.